DigiPile™ is the revolutionary, digital family of Thermopile Sensors designed specifically for non-contact temperature measurement. The DigiPile Family is offered in traditional TO-46 and TO-5 metal housings as well as our newest SMD model in a ceramic-type package - the TPiS 1S 1253. We are not limited to off-the-shelf, standard designs and cater to user customization for the most demanding infrared sensing applications. 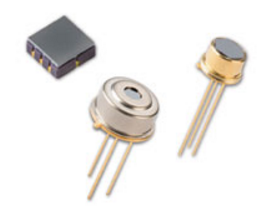 The wide range of Thermopile Detectors include Single-Element, Dual- Element and Quad-Element designs. The “Element” refers to the size of the infrared absorbing surface. We offer various surfaces and housings. Founded in 2009, Inno-V Global has two divisions. A premier supplier of photonics related products and a provider of 3D services. Our headquarter is located in Singapore. © Copyright 2016. Inno-V Global Pte Ltd. All Rights Reserved.